The Gay Men’s meditation group meets from 9 to 12 on Sunday mornings at the Hazy Moon Zen Center. Please check the schedule to confirm dates. Newcomers are very welcome. We combine sitting and walking meditation in the manner of Tibetan and Zen traditions. Free instruction is available for people new to meditation. 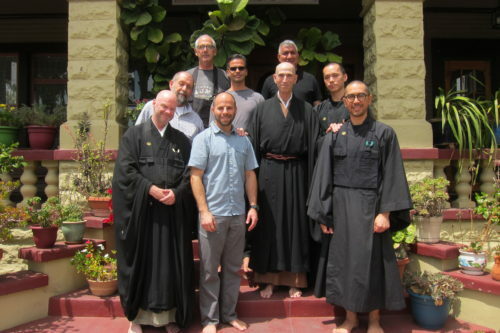 The Gay Men’s Meditation Group is a group of gay and straight men in Los Angeles who meet weekly to practice Buddhist meditation and study Buddhist teachings. Over the past twelve years, we have found there is much to be gained from gay men practicing together. Being together has promoted honesty, encouraged sitting practice, developed close friendships, and helped to open our hearts. None of us have felt excluded or put down by other dharma groups; in fact most of us continue to receive teachings from a variety of Tibetan or Zen teachers, but the benefits of practicing as a sangha have undeniably enriched our lives. The Gay Men’s Meditation Group holds monthly zazenkais, one day meditation retreats, at Hazy Moon Zen Center. The day begins at 9 A.M. and ends at 5 P.M. We follow a traditional format of 30 minutes of sitting/meditation practice followed by 10 minutes of walking meditation. This sequence is repeated from 9 to 12 in the morning and 1:30 to 4:30 in the afternoon. There is an hour and a half break for lunch – participants need to bring their own lunch. Tea and coffee are provided. There is a very short dharma reading in the morning and afternoon. The Heart Sutra and Bodhisattva vow are recited at the beginning of the day and we bring the day to a close with the dedication of merit and the Four Great Zen Vows. It is a wonderful way to deepen one’s practice. All day participation is encouraged but not required. There will be a voluntary donation basket to express our appreciation to The Hazy Moon Zen Center for the use of its beautiful zendo.